Full length native protein (purified) corresponding to Human Laminin 5. Our Abpromise guarantee covers the use of ab14509 in the following tested applications. WB Use at an assay dependent concentration. Detects a band of approximately 165, 140, 105 kDa. Laminins, a family of extracellular matrix glycoproteins, are the major noncollagenous constituent of basement membranes. They have been implicated in a wide variety of biological processes including cell adhesion, differentiation, migration, signaling, neurite outgrowth and metastasis. Laminins, composed of 3 non identical chains: laminin alpha, beta and gamma (formerly A, B1, and B2, respectively), have a cruciform structure consisting of 3 short arms, each formed by a different chain, and a long arm composed of all 3 chains. Each laminin chain is a multidomain protein encoded by a distinct gene. Several isoforms of each chain have been described. Different alpha, beta and gamma chain isomers combine to give rise to different heterotrimeric laminin isoforms which are designated by Arabic numerals in the order of their discovery, i.e. alpha1beta1gamma1 heterotrimer is laminin 1. The biological functions of the different chains and trimer molecules are largely unknown, but some of the chains have been shown to differ with respect to their tissue distribution, presumably reflecting diverse functions in vivo. This gene encodes the gamma chain isoform laminin, gamma 2. The gamma 2 chain, formerly thought to be a truncated version of beta chain (B2t), is highly homologous to the gamma 1 chain; however, it lacks domain VI, and domains V, IV and III are shorter. It is expressed in several fetal tissues but differently from gamma 1, and is specifically localized to epithelial cells in skin, lung and kidney. The gamma 2 chain together with alpha 3 and beta 3 chains constitute laminin 5 (earlier known as kalinin), which is an integral part of the anchoring filaments that connect epithelial cells to the underlying basement membrane. The epithelium-specific expression of the gamma 2 chain implied its role as an epithelium attachment molecule, and mutations in this gene have been associated with junctional epidermolysis bullosa, a skin disease characterized by blisters due to disruption of the epidermal-dermal junction. Two transcript variants resulting from alternative splicing of the 3' terminal exon, and encoding different isoforms of gamma 2 chain, have been described. The two variants are differentially expressed in embryonic tissues, however, the biological significance of the two forms is not known. Transcript variants utilizing alternative polyA_signal have also been noted in literature. ICC/IF image of ab14509 stained HeLa cells. The cells were 4% formaldehyde fixed (10 min) and then incubated in 1%BSA / 10% normal goat serum / 0.3M glycine in 0.1% PBS-Tween for 1h to permeabilise the cells and block non-specific protein-protein interactions. 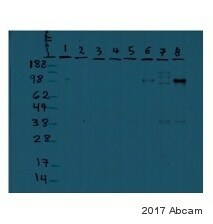 The cells were then incubated with the antibody (ab14509, 5µg/ml) overnight at +4°C. The secondary antibody (green) was Alexa Fluor® 488 goat anti-rabbit IgG (H+L) used at a 1/1000 dilution for 1h. Alexa Fluor® 594 WGA was used to label plasma membranes (red) at a 1/200 dilution for 1h. DAPI was used to stain the cell nuclei (blue) at a concentration of 1.43µM. Publishing research using ab14509? Please let us know so that we can cite the reference in this datasheet. The product sheet for ab14509 (anti-LN5) states that it is "protein G purified". Can you please tell me how this was accomplished? I would like to prepare a control serum in an identical manner. 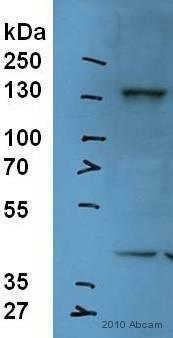 Customer kindly contact us about ab14509 Anti-Laminin 5 antibody not working in western blot on purified protein. Comme expliqué dans mes précédents emails, si il n'y a pas de FDS associé à un produit (ab83774 par exemple) c'est que ce produit ne contient aucun produit dangereux et ne nécessite donc pas un tel document. Inquiry: Does this antibody react with pig tissue? I was wondering is there any antibody reacting with Laminin-5 in pig tissue? Thank you. I am sorry to confirm that as far as we are aware, none of our laminin 5 antibodies has been tested on pig tissue. All tested species cross-reactivity and tested applications covered by our guarantee are stated on our datasheets, and these are updated as soon as any new information is brought to our attention. We recommend that alignment between the immunogen sequence and sequence from a different species should be over 85% to predict that an antibody will detect. Unfortunately, I am sorry I am not able to find the pig laminin 5 sequence on the protein database sites to try an alignment with the immunogens for the laminin 5 antibodies that we have. Therefore, regrettably I cannot say on this occasion how likely it is that the antibodies will detect in pig. I have copied below a list of the antibodies with the immunogen sequences. I can suggest to try an alignment if you have the pig sequence. Or I will be pleased to do this for you if you are able to provide the sequence from pig. If the alignment is high for any of these antibodies and you would like to test one in pig samples, please do not hesitate to let me know replying to this message prior to the purchase as you may be eligible for our testing discount program. Can we have some details about starting range dilution of your AB14509 for western blot application ? Thank you for your enquiry. I can recommend using a starting dilution of 1ug/ml for WB. However, please bear in mind that optimum conditions/concentrations should be determined by the end user. I hope this will help you get started with your experiment. If there is anything else that I can assist you with, please do not hesitate to contact me.